This week it’s Five Favourite Saturday! We’re a day late with our post due to dealing with a very poorly little boy who has caught chicken pox! This weeks topic is crisp flavours! I love a packet of crisps, my problem is that once I start I can’t stop! So here are my favourite flavour of crisps to pig out on! 5. Cheese & Onion. A tad boring I know but every so often I do just have a hankering for some cheese & onion crisps. 4. Prawn Cocktail. I don’t know many people who don’t like prawn cocktail. I just love how it can be quite tangy! 3. Salt & Vinegar. Again, another boring one. But the salt & vinegar crisps I like the most are Walkers Squares. Yum! 2. Beef & Onion. This went off the shelves for a while but boy am I glad they’re back!! An honourable mention goes out to the Ready Salted and Lightly Salted flavoured crisps as they go with anything. Whatever you happen to have in your sandwich, the flavours just do not clash! 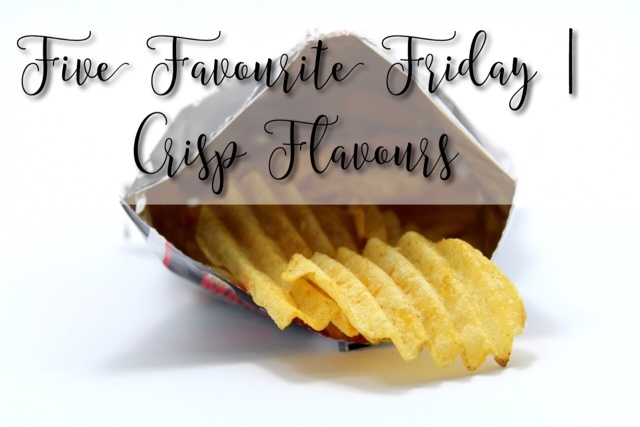 What are your favourite crisp flavours? As ever, head on over to Broken Thoughts to read Tim’s post and see what the topic is for next week!